A model for understanding WHY we do WHAT we do. Start a free assessment on your blind spots by Kevan Davis. Named for its creators, Joseph Luft and Harry Ingham - the Johari Window is a useful tool for understanding and integrating misunderstood or unknown parts of ourselves. 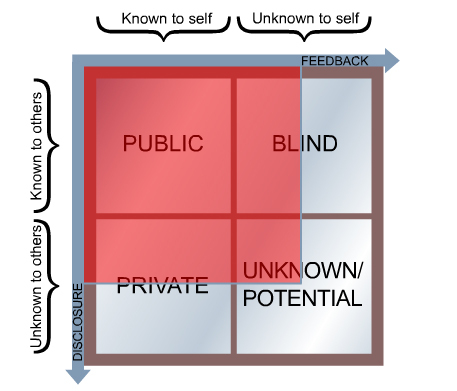 The Four Panes of the Johari Window represent the four parts of Self. A self-aware person has a large Public Self crowding out the other panes and making them smaller in comparison. This person understands why she acts the way she does and is genuine and open with others. Transparency (allowing people access to thoughts, needs, feelings and values) is common while mistakes, or insensitivity to others, is quickly handled to ensure high trust relationships. From Serenity Online Therapy: "A generally unaware person has a small Public Self with the other three areas large in comparison. This person acts in ways he doesn't understand because outdated decisions and defense mechanisms have caused him to develop substantial Blind Spots. In addition, he is guarded and less genuine with others because he has developed a significant Hidden Self as a defense against his own deep-seated shame. In short, he has disconnected from his True Self, becoming more defended than genuine." From Noogensis.Com: The "blind" quadrant represents things that you know about me, but that I am unaware of. So, for example, we could be eating at a restaurant, and I may unknowingly have some food on my face. This information is in my blind quadrant because you can see it, but I cannot. If you now tell me that I have something on my face, then the window shade moves to the right, enlarging the open quadrant's area. Now, I may also have blindspots with respect to much more complex things. For example, perhaps in our ongoing conversation, you may notice that eye contact seems to be lacking. You may not say anything, since you may not want to embarrass me, or you may draw your own inferences that perhaps I am being insincere. Then the problem is, how can I get this information out in the open, since it may be affecting the level of trust that is developing between us? How can I learn more about myself? From BusinessBalls.Com: The Hidden Self is what is known to us but kept hidden from others. This hidden or avoided self represents information and feelings not revealed or kept secret from others. The hidden area could also include sensitivities, fears, hidden agendas, manipulative intentions, past actions - anything that a person knows but does not reveal, for whatever reason. It's natural for very personal and private information and feelings to remain hidden, (indeed, certain information, feelings and experiences have no bearing on work). However, typically, a lot of hidden information is not very personal, it is work- or performance-related, and so is better positioned in the open area. This area is unseen by everyone, including ourselves. Our unconscious quadrant reveals itself in (usually) unwanted ways such as blurting out a hurtful comment, always running late, overeating following a commitment to diet, and other self-sabotaging actions. While there are several advantages to self-disclosure, there are also risks. One risk is that the person will not respond favorably to the information. One perceived risk is that the other person will gain power in the relationship because of the information they possess. Finally, too much self-disclosure or self-disclosure that comes too early in a relationship can damage the relationship. Thus, while self-disclosure is useful, it can also be damaging to a relationship. Becoming open (and resilient) to feedback is key to increasing your public or arena quadrant. The study of Shadow Work (see Carl Jung or Debbie Ford's work in this area) will also provide excellent and accurate information on the hidden quadrant.